These Venus figurines are typical of the Gravettian culture. The Gravettian tool-making culture was a specific archaeological industry of the European Upper Paleolithic era prevalent before the last glacial maximum. It is named after the site of La Gravette in the Dordogne region of France where its characteristic tools were first found and studied. The earliest signs of the culture were found at Kozarnika, Bulgaria. Authorities give slightly different dates for this culture. Brian M. Fagan suggests it lasted from around 27,000 to 16,000 BCE while Richard Klein suggests between 26,000 and 20,000 BCE. Where found, it succeeded the artifacts datable to the Aurignacian culture. In August 2013, Romanian archaeologists found a 20,000-year-old Gravettian pendant at the Paleolithic site of Poiana Ciresului (English: 'Cherry Glade'), near Piatra Neamț, in eastern Romania. The newly discovered objects will be included in the Paleolithic artifacts collection of the Târgoviște History Museum, in the new section of human evolution. The department will open at "Stelea" Galleries with the support of the Dâmboviţa County Council. The diagnostic characteristic artifacts of the industry are small pointed restruck blade with a blunt but straight back, a carving tool known as a burin. Artistic achievements of the Gravettian cultural stage include hundreds of Venus figurines, which are widely distributed in Europe. The predecessor culture was linked to similar figurines and carvings. 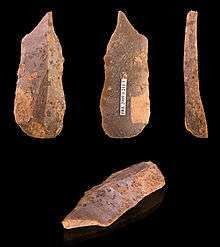 Gravettian culture is a phase of the European Upper Paleolithic that is characterized by a stone-tool industry with small pointed blades used for big-game hunting (bison, horse, reindeer and mammoth). People in the Gravettian period used nets to hunt small game. For more information on hunting, see Animal Usage in the Gravettian. It is divided into two regional groups: the western Gravettian, mostly known from cave sites in France, and the eastern Gravettian, with open sites of specialized mammoth hunters on the plains of central Europe and Russia such as the derivative Pavlovian culture. Artifacts and technologies of this and the preceding Aurignacian culture figure centrally in the romanticized adaptation of the culture in the popular fictive prehistory depicted in the Earth's Children novel series which leans heavily on archeological finds and theories from this era. 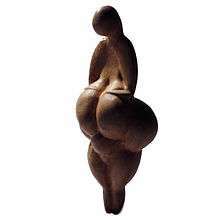 In the series, the Venus figurines are central to a fertility rite and worship of "The Great Earth Mother," a spirit from which all life flows. Wikimedia Commons has media related to Gravettian.